Synopsis: Four friends accidentally travel back in time and relive their young adulthood in 1986.
Review: Once again, I want to start off by saying that in no way is this a great film…but one you can definitely have a fun time with. On the other hand, this is one of those few comedies where I have laughed almost literally the entire runtime. John Cusack may be my favorite actor, he is just one of those actors you can count on for a good movie. Having been in some of my favorite films such as High Fidelity, Grosse Pointe Blank, Say Anything, Better off Dead, and The Grifters…he is pretty reliable. 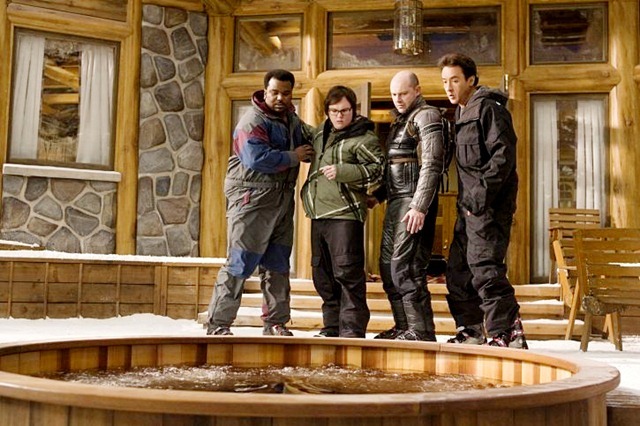 Craig Robinson (The Office), Rob Corddry, and Clark Duke provide more than capable sidekicks here delivering the film’s funniest lines…most notably Corddry. I have to say this film really made me miss the fun and senseless comedies of the 80s like Better off Dead (also starring Cusack, coincidence?). These are the comedies I really enjoy watching: outrageous, senseless, charismatic and very often inappropriate. It’s hard to find a good comedy that doesn’t stray from making you laugh consistently, without serious subplots that really take the fun out of it. This film never does that, it keeps a strong gauge on the comedy, and even adds some very funny things when there tends to be a “more serious” moment. Overall, the likeable cast really makes this a fun ride with each one clearly having a lot of fun with the script and their characters. The plot is off-the-wall and features an appearance by Crispin Glover that is priceless. I highly recommend this one to anyone who can handle some good outrageous and inappropriate humor. This is a very entertaining film.